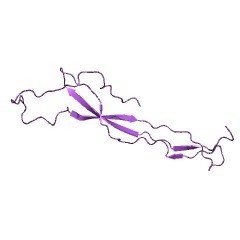 This domain is found in a wide range of extracellular proteins. It is found tandemly repeated in up to 8 copies. It is found in the N-terminus of peptidases belonging to the M26 family which cleave human IgA. The domain is also found in proteins involved in metabolism of bacterial cell walls suggesting this domain may have an adhesive function. 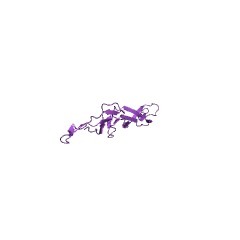 The G5 domain (named after its conserved glycine residues) is a module of ~80 residues that is found in a variety of enzymes such as Streptococcal IgA peptidases and various glycosyl hydrolases in bacteria. It is found in one to seven copies in association with other domains, such as LysM, bacterial Ig-like, M23 and M26 peptidases, F5/8 type C, vanW or transglycosylase-like. 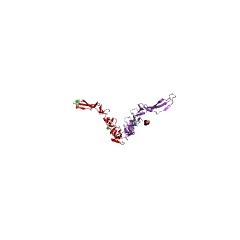 The G5 domain contains a few highly conserved residues. None of these conserved residues are the polar types of amino acids found in active sites, so it seems unlikely this region has an enzymatic function. However, in nearly all cases the G5 domain is associated with a known enzymatic domain. Therefore, the G5 domain may confer localization or substrate specificity on the proteins in which it is found. 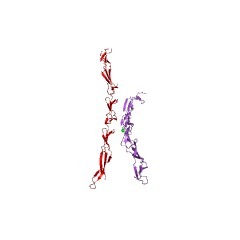 As a common feature of the proteins containing G5 domains is N-acetylglucosamine binding, it has been suggested that this function might be attributed to the G5 domain. Other alternative functions could be allosteric regulation of the enzymatic domain or cofactor binding [(PUBMED:15598841)]. There are 18715 G5 domains in 12194 proteins in SMART's nrdb database. Taxonomic distribution of proteins containing G5 domain. This tree includes only several representative species. The complete taxonomic breakdown of all proteins with G5 domain is also avaliable. Click on the protein counts, or double click on taxonomic names to display all proteins containing G5 domain in the selected taxonomic class. 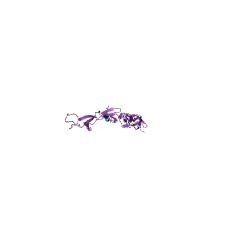 Crystal structure of the resuscitation-promoting factor (DeltaDUF)RpfB from M.tuberculosis. Mycobacterium tuberculosis is able to establish a non-replicating state andsurvive in an intracellular habitat for years. 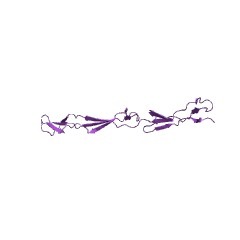 Resuscitation of dormant M.tuberculosis bacteria is promoted by resuscitation-promoting factors (Rpfs),which are secreted from slowly replicating bacteria close to dormant bacteria.Here we report the crystal structure of a truncated form of RpfB (residues194-362), the sole indispensable Rpf of the five Rpfs encoded in this bacteriumgenome. 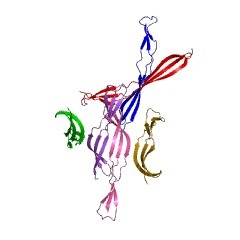 The structure, denoted as (DeltaDUF)RpfB, exhibits a comma-like shapeformed by a lysozyme-like globular catalytic domain and an elongated G5 domain,which is widespread among cell surface binding proteins. The G5 domain, whosestructure was previously uncharacterised, presents some peculiar features. 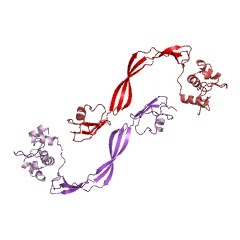 Thebasic structural motif of this domain, which represents the tail of thecomma-like structure, is a novel super-secondary-structure element, made of twobeta-sheets interconnected by a pseudo-triple helix. This intricate organisation leads to the exposure of several backbone hydrogen-bond donors/acceptors.Mutagenesis analyses and solution studies indicate that this protein construct aswell as the full-length form are elongated monomeric proteins. Although(DeltaDUF)RpfB does not self-associate, the exposure of structural elements(backbone H-bond donors/acceptors and hydrophobic side chains) that are usuallyburied in globular proteins is typically associated with adhesive properties.This suggests that the RpfB G5 domain has a cell-wall adhesive function, whichallows the catalytic domain to be properly oriented for the cleavage reaction.Interestingly, sequence comparisons indicate that these structural features arealso shared by G5 domains involved in biofilm formation. The G5 domain: a potential N-acetylglucosamine recognition domain involved inbiofilm formation. SUMMARY: Biofilms are complex microbial communities found at surfaces that areoften associated with extracellular polysaccharides. Biofilm formation is acomplex process that is being understood at the molecular level only recently. Wehave identified a novel domain that we call the G5 domain (named after itsconserved glycine residues), which is found in a variety of enzymes such asStreptococcal IgA peptidases and various glycosyl hydrolases in bacteria. The G5 domain is found in the Accumulation Associated Protein (AAP), which is animportant component in biofilm formation in Staphylococcus aureus. 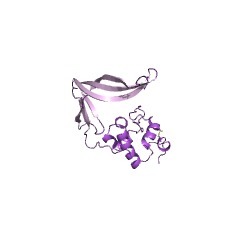 A commonfeature of the proteins containing G5 domains is N-acetylglucosamine binding, andwe attribute this function to the G5 domain. CONTACT: agb@sanger.ac.uk.